Look forward to continuing the journey with you! My first born turns 7 this week. I can’t believe it. Happy Birthday sweet boy! I love the young man you are growing into. May God continue to guide us both! Have you seen those 5-Year Line-A-Day memory books? I love the idea–write a little something each day and then when you cycle back the next year you can reminisce about where you were that time in the past. In reality, the thought of keeping up a single journal for 5 years is really overwhelming. How about something a little less, um, ambitious . 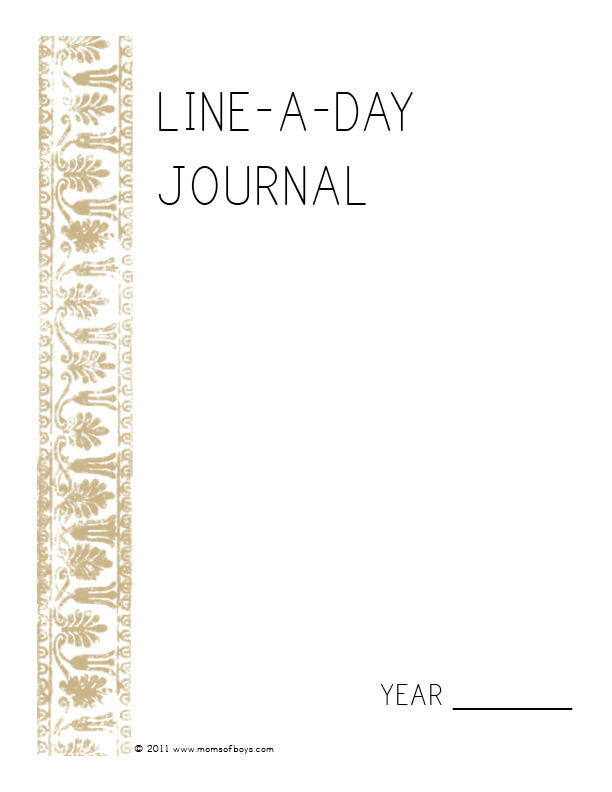 . .
Free for you–a one year line-a-day journal. The PDF contains a cover page and pages for each day of the month 1-31 with twelve areas on each page for the months. Posting will be a little light through the end of the year, but I have big plans for after the new year including a NEW ADDRESS! Details to come when I finish cleaning house and putting on a fresh coat of paint 🙂 In the meantime, enjoy this–my favorite reminder of the season. He who observes the day. Are you willing to forget what you have done for other people, and to remember what other people have done for you; to ignore what the world owes you, and to think what you owe the world; to put your rights in the background, and your duties in the middle distance, and your chances to do a little more than your duty in the foreground; to see that your fellow-men are just as real as you are, and try to look behind their faces to their hearts, hungry for joy; to own that probably the only good reason for your existence is not what you are going to get out of life, but what you are going to give to life; to close your book of complaints against the management of the universe, and look around you for a place where you can sow a few seeds of happiness–are you willing to do these things even for a day? 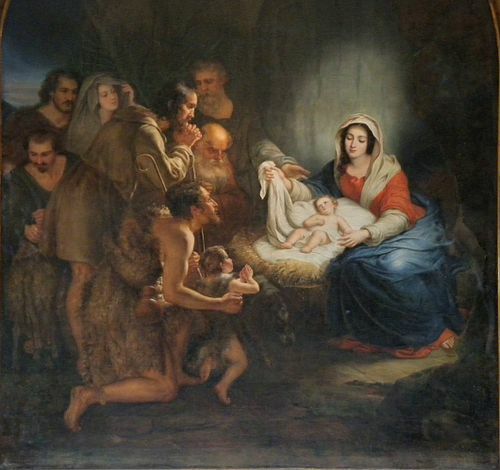 Then you can keep Christmas. Special thanks to Carol Anderson and Sheila Carroll for introducing me to Van Dyke. Last year I posted some of my favorite holiday books for “Christmas Book Week.” We have added some new ones to our list this year as well as our former favorites. If you are looking for some ideas, this is a good place to start. As in the past I wrap all the books and put them under the tree for unwrapping each day. Christmas at the Barn I found this Barbary Cooney illustrated version at a local library sale. The newer version features pictures by Diane Goode. Babushka I found this Russian folktale during our Geography Through Folk Tales study. The Sweet Smell of Christmas by Patricia Scarry–scratch and sniff! The Year of the Perfect Christmas Tree by Gloria Houston — I love this story. The town of Spruce Pine where the book is set is nearby and has a store devoted to the book featuring work of local artisans. We Three Kings Gennady Spirin–set to the lyrics of the classic carol, the illustrations are phenomenal. Wombat Divine by Mem Fox–cute little story about a wombat in Australia who wants to be in the nativity play. Dewey’s Treehouse and Oopsey Daisy also have book advents going on for more selections. This is a repost from 2010. We just made these again yesterday. Pickle added a gum drop angel to the top. A new tradition he says. It’s getting harder to get things done (like updating my blog) around here. However, I know that lots of moms are probably starting to dip into their “box of rainy day” activities already or will be by next week so I thought I would share a couple more ideas over the next few days before I take a long weekend off. We love doing these, and this year both boys got in on the action. 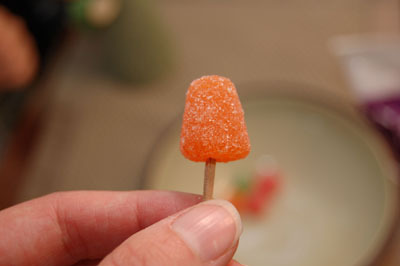 Gather up a bag or two of Spice Drops, a box of toothpicks, and a cone-shaped craft foam mold (is that what they are called?) You can find them at Michaels or the dollar store usually. I cut all the toothpicks in half for easier placement in the cone. Let the kids put on the gum drops and then stuff them in the cone. If you are super-decorative you could do rows of different colors, designs, etc. We just went free-form. 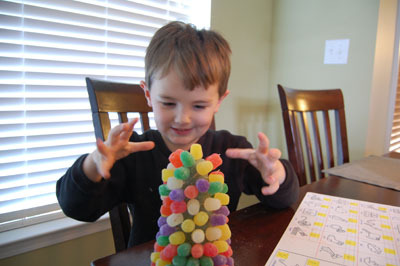 Don’t you think your Christmas village needs a gum drop tree? Of course, after you fill up the tree you will have to eat some of the leftovers. Yum! I love this stuff. As we speak I have two containers of it sitting on my dryer. I intend to give some to the neighbors, but I am seriously having doubts that it will last that long. This is an easy recipe and there are lots of ways for the kiddos to help. Also since the peppermint is only a “crust” it doesn’t overwhelm the chocolate flavor like a peppermint oil would. For the fudge I use the recipe on the back of the Jet-Puffed Marshmallow Creme for “Fantasy Fudge,” but any recipe could be modified to include the candy cane flavor. Step 2: Line a 9×9 square dish with foil wrap. Place candy cane crumbs in the bottom of the dish covering the bottom. 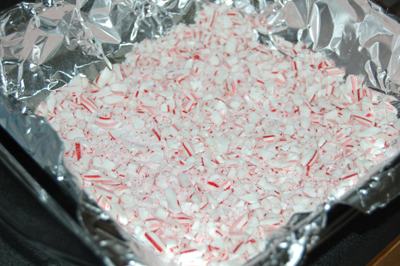 POUR into prepared pan with candy canes; spread to cover bottom of pan. Cool completely. Use foil handles to lift fudge from pan before cutting into squares. Are you a MOB--a mother of boys? If so, then you have found the right place. 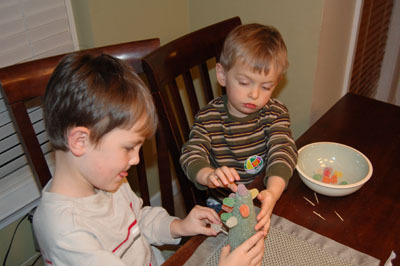 We are a place where you can learn about the life of a boy, find fun boy-friendly crafts, toys, and adventures, and enjoy being part of the MOB. Whether you have one boy or ten, stop by often and share life with us. Photos and text copyright Chris McGinn 2010. Feel free to link back but please do not take my text or photos without credit or proper linking. Please do not use photos of my children. Please email me for permission to copy/print/report entire posts. I am an Amazon Affiliate. If you purchase something on Amazon from a link on my page, I make a percentage of the purchase. It helps fund my homeschool so please use the links if you see something you want! Looking for the Boy-Friendly Gift Guide?